(To substitute for an egg I use 1 teaspoon gelatin, softened in 1 Tablespoon cold water, 2 T boiling water, plus 1 Tablespoon oil, and 1/2 tsp more baking powder) or use 1 Tablespoon flaxmeal and add the extra 1/2tsp baking powder to the flour mix. 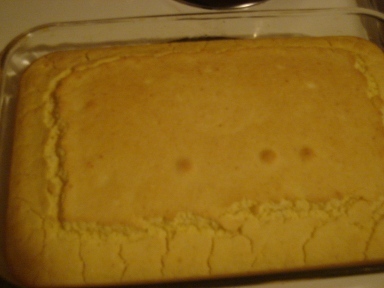 This recipe can be used for an 8 inch square pan of cornbread. The picture is 3 times the recipe amount, so triple all ingredients for a 9x13 pan and bake 35-40 minutes. In medium bowl mix flour mix, cornmeal, baking powder, salt and sugar. Blend well. In another bowl combine egg, oil and milk. Blend. Pour over dry ingredients in medium bowl and stir until all dry ingredients are moistened and incorporated. Pour or spoon batter into greased muffin tins or greased pan. In preheated 400 degree oven bake 20-25 minutes until light golden brown. Check with toothpick in center for doneness. Top should spring back when pushed. Best made for serving warm. 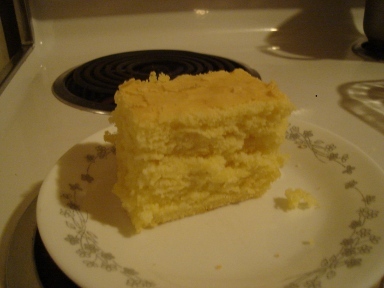 This is my favorite gf cornbread. Enjoy! This recipe can also be made into muffins, just use cupcake liners or grease a muffin tin and fill 2/3 full. Bake for 10-12 minutes.